James, the Connoisseur Cat by Harriet Hahn is the story of James, a cat that has human tendencies and one who solves mysteries and a businessman who is visiting London. They form an unlikely friendship and have adventures together. Now this book sounded quite interesting when the publishers invited me to review it. However, right from the start I just could not get into the story. The cat, James and the businessman met and then kept having meetings but the story just kept flowing with no excitement building for me. I kept hoping to feel the eagerness and the thrill of watching James, a talking cat go on adventures but the book was pretty boring. Almost after half the story had come and gone, the author picked up pace and the story got a bit crisp but overall, this book felt half cooked and an average story that didn't entertain me as much as I would have liked. Maybe, it has some target readership but it is not for me. Also despite having a talking cat which gives a sense that maybe it is a children's book, it is too mature to be understood and enjoyed by children and a bit too fantastic to be enjoyed by adults. 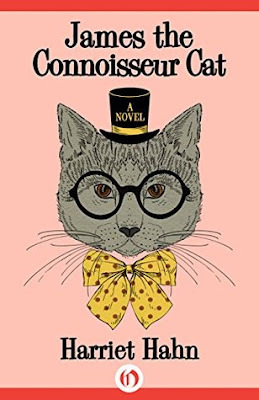 All in all, James, the Connoisseur Cat by Harriet Hahn was a book I didn't quite understand and enjoy. Although a cozy mystery, I didn't feel the thrill and give it 2.5 stars out of 5.